A recipe that is so easy to make and delicious to eat. This is perfect for your family cookbook. I was watching Rachael Ray one morning and saw her make this dish and I just had to make it. This is one dish that has now become an indulgence in our house and you will see why once you taste it. Rachael Ray used pancetta I substituted with Kirkland Bacon Crumbles from Costco. They are delicious and a perfect time saver for the cook in your family. Put a large saucepot of water on to boil. Add a liberal amount of salt and the pasta. Cook to al dente, about 8 minutes. Meanwhile, heat a large skillet over medium heat. Add the olive oil and bacon crumbles. Brown bacon for 2 minutes. 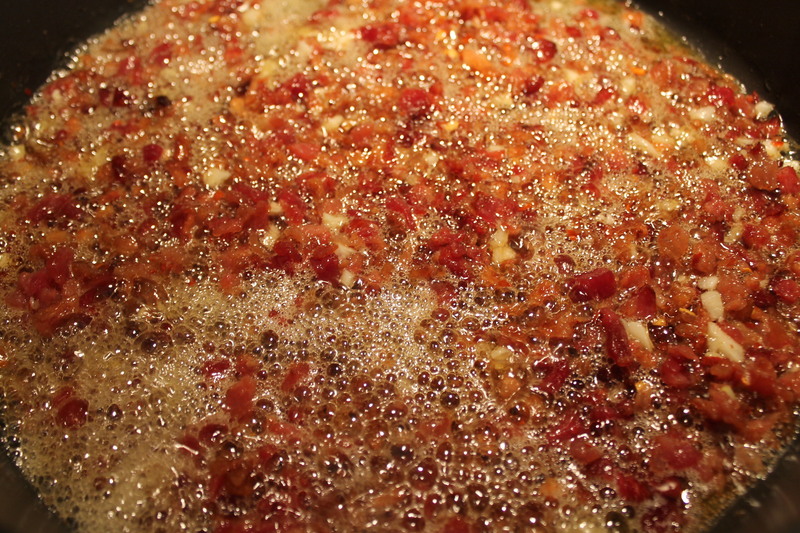 Add red pepper flakes and garlic, and cook 2-3 minutes more. Add wine and stir up all the pan drippings. 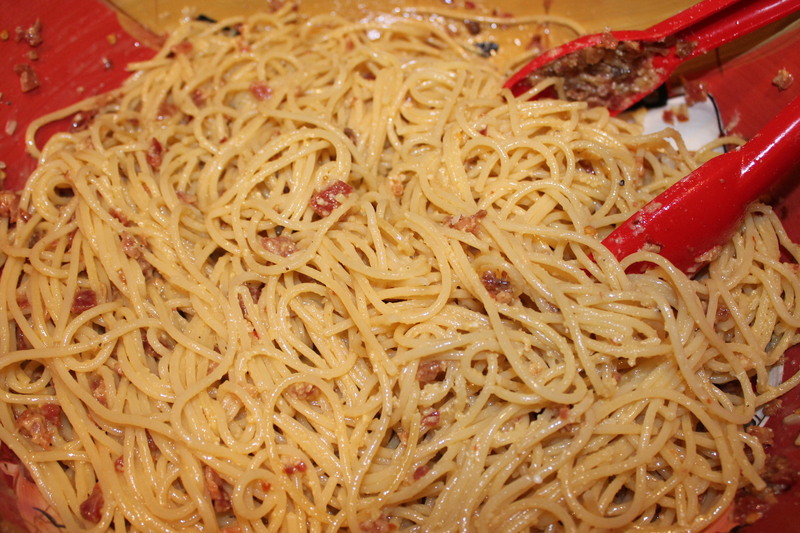 In a separate bowl, beat yolks, then add 1 large ladleful (about 1/2 cup) of the pasta cooking water. This tempers the eggs and keeps them from scrambling when added to the pasta. 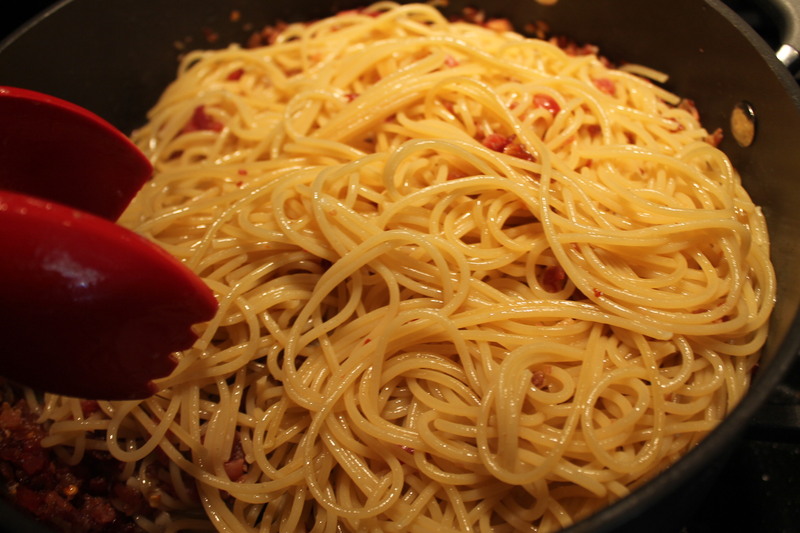 Drain pasta well and add it directly to the skillet with pancetta and oil. 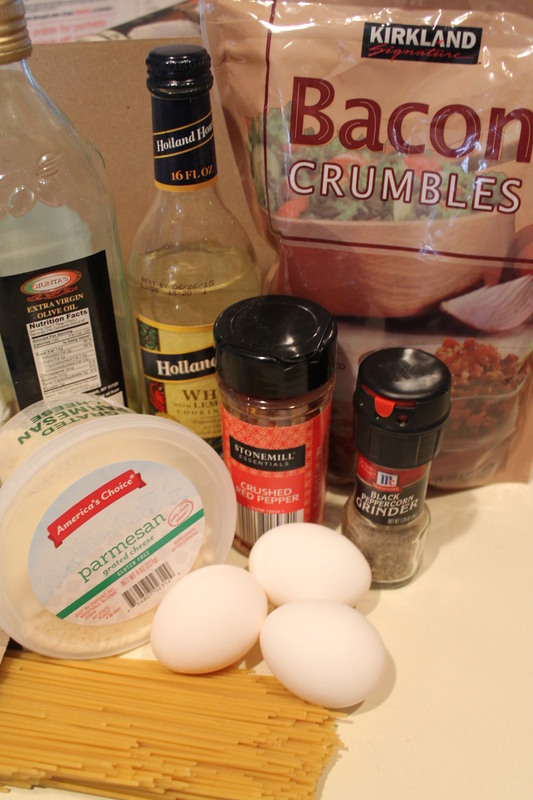 Pour the egg mixture over the pasta. 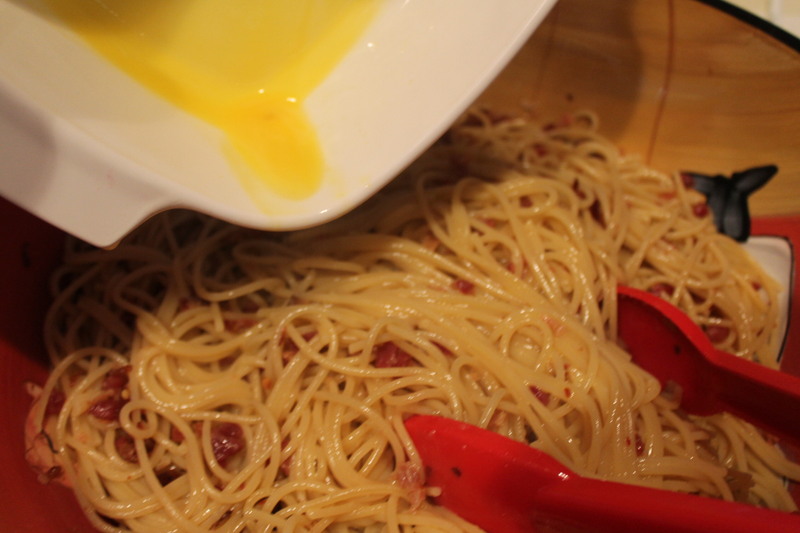 Toss rapidly to coat the pasta without cooking the egg. Remove pan from heat and add a big handful of cheese, lots of pepper and a little salt. 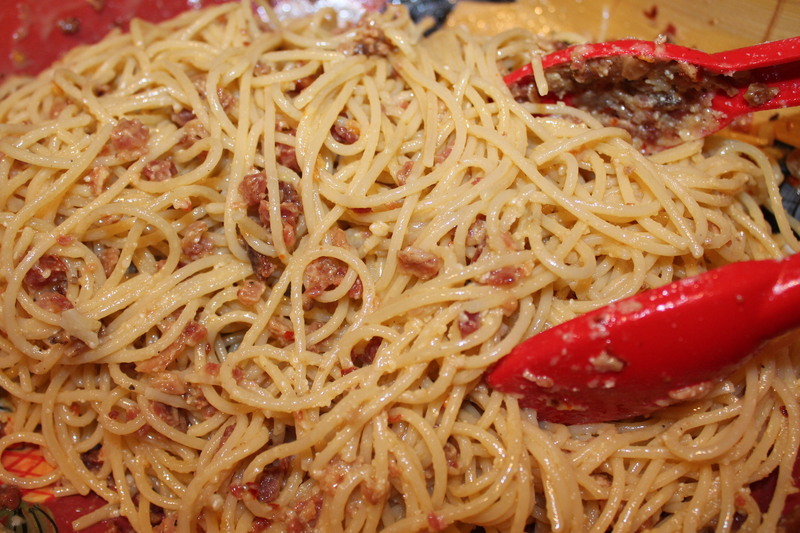 Continue to toss and turn the pasta until it soaks up egg mixture and thickens, 1-2 minutes. 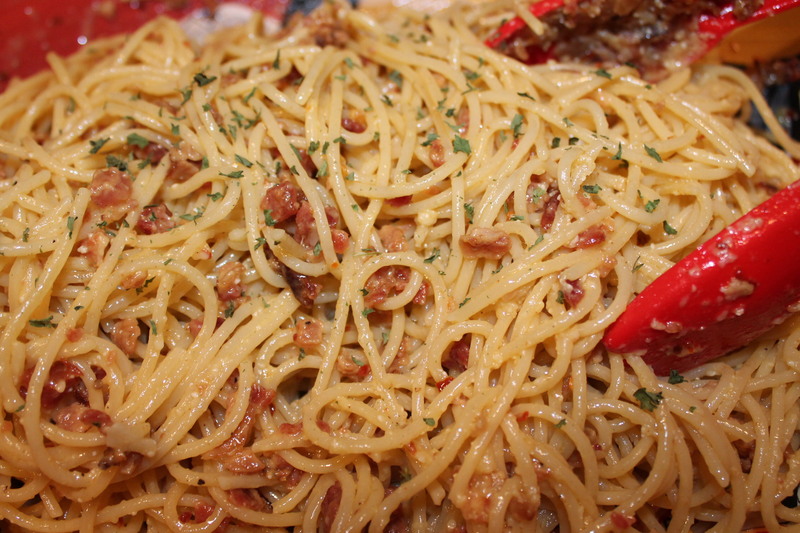 Garnish with parsley and extra grated Romano. This sounds fantastic. I have a big pkg of Kirkland Bacon Bits….now I know just what I’m going to do with them. Thanks for sharing!